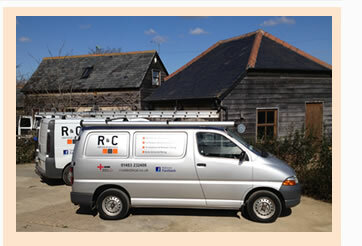 R and C Electrical Solutions is a family run firm of Guildford Electricians offering a full range of electrical services to homes and businesses in Guildford and the surrounding area. We are fully NIC EIC registered, Part P compliant and fully insured giving you peace of mind that the work we carry out will be of the highest standard. We offer a free quotation service without obligation and we look forward to discussing your requirements. Why choose an R & C Electrician? Experienced and friendly, family run with excellent references. NIC EIC Registered, Part P approved & fully insured. All electrical work undertaken at competitive prices. Free no obligation quotation service.